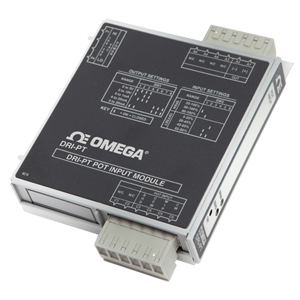 The DRI-PT is a DIN rail mount, potentiometer input signal conditioner with 1800 Vdc isolation between AC power and the input/output circuitry. The input provides a constant voltage and is designed to accept any 3-wire potentiometer from 100 Ω to 100 kΩ. The field configurable output is switch selectable providing a 0 to 5V, 0 to 10V, 0 to 1 mA, 0 to 20 mA or 4 to 20 mA DC signal. Wide ranging, precision zero and span pots, used in conjunction with DIP switches, allow 80% adjustablity of offset and gain to transmit a full scale output from any 20% portion of the potentiometer input. The DRI-PT is useful in transmitting process control setpoints to remote PID controllers or interfacing position or level sensors to data acquisition and control systems. The high density DIN rail mounting offers an extremely compact solution for saving valuable panel space. In a valve positioning application a potentiometer is sometimes used as a feedback signal. Quite often a wide open valve is only a 25% turn of the feedback potentiometer. The DRI-PT can easily be adjusted with the zero and span to provide a full scale output signal (e.g. 4 to 20 mA) representing 0 to 25% or even 50 to 75% of the potentiometer input. Note: An ACPB power rail is required to power the modules and is ordered separately.